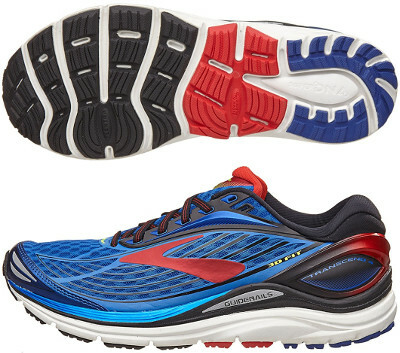 Brooks Transcend 4 are stability cushioned running shoes. The supportive Brooks Transcend 4 updates the premium stability model from american brand in order to get market share from the leader Asics Gel Kayano 23. Plenty of cushioning and latest materials, the Transcend 4 does not use typical medial post but Guide Rails™ for pronation support. It is a great choice to run long distances with maximum comfort and its 8 mm drop promotes a smooth transition. As a typical annual update, upper has been improved from its predecessor Transcend 3 based on feedback from users and major highlight is the introduction of the fused 3D Fit structure to provide a custom fit. Another element that usually gets improved is the heel counter which in current edition is made of PeBax to reduce heel rotation and enhanced stability. Plush interior not only provides luxurious comfort but also moisture transfer to keep ventilation in long runs. Abundant cushioning does not change in Transcend 4 with soft but reliable Super DNA™ midsole. Guide Rails™ system has been improved based on feedback from unbiased runners to make pronation support more progressive. Outsole configuration has been slightly modified looking for more flexiblity resulting in smoother transition while keeping the idea of pressure dispersion through Ideal Pressure zones.